In a groundbreaking decision that critics say could limit the state’s control of political money, Massachusetts campaign finance regulators concluded that the state Republican Party can give federally raised resources to Governor Charlie Baker’s campaign committee. The determination announced Thursday was made after a 10-month review by the Office of Campaign and Political Finance, which says it found that Baker and Lieutenant Governor Karyn Polito are not violating a 1998 state law that bans larger, federal donations from being used in state political activities. Michael Sullivan, director of the Office of Campaign and Political Finance, said in revealing the settlement with the state Republican Party that federal campaign finance laws trump state law. That means a political party is free to raise donations of up to $10,000 under federal guidelines, far above the state’s $1,000 annual limits, and then use those funds to support a state campaign committee. Typically, donations raised under federal guidelines have been used to support candidates for federal — not state — office. The agency’s finding stunned veteran political operatives and advocates for campaign finance reform. Pam Wilmot, executive director of Common Cause Massachusetts, expressed concern that the settlement will increase special interest influence. Secretary of State William F. Galvin, who chairs the commission to select directors of the political finance office, said the ruling is a blow to the state’s attempts to enforce transparency because it will also allow candidates to use money that can’t be traced to specific donors. He called the decision “flawed’’ because, he said, without any court ruling, it overrides state law in favor of a political party’s interpretation. But the state GOP hailed the decision as a victory over Massachusetts Democrats who filed a complaint — based on a Globe story — with the campaign finance office in June. 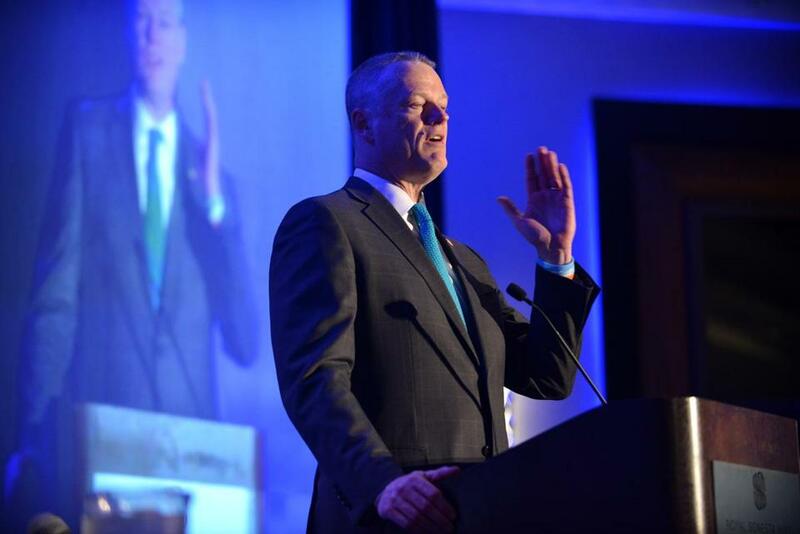 “We are pleased that the baseless accusations made by the Massachusetts Democrat Party concerning the MassGOP’s support for Governor Baker have been rejected by state regulators,” said Brian Wynne, executive director of the state GOP, in an e-mailed statement. The Globe reported in June that, by tapping resources funded through the state GOP’s federal account, Baker hasn’t had to use his campaign committee to pay staff salaries, office rent, health insurance, payroll taxes, and other costs. His aides insist most of the work is performed by one fund-raising consultant not on staff, David Drummond, who is paid partly from Baker’s state campaign committee and partly through the GOP’s federal committee. Baker’s state campaign committee has paid Drummond about $30,000 since April 2015, a period in which the governor raised a record $3.4 million. Campaign finance records show the committee hosted at least 90 or more events since Baker took office. By comparison, former governor Deval Patrick’s campaign committee, when it raised just under $1 million in 2008, paid close to $260,000 for staff, $72,000 in office rent, and $7,000 for phones. In 2015, Mayor Martin Walsh of Boston raised close to $1.25 millionand paid his fund-raising staff and consultants $200,000. Baker was able to pay Drummond so much less because the consultant is also paid $3,538 per month from the party’s federal committee; he raised about twice as much for Baker’s state committee as he did for the federal committee. Campaign regulators said federal law requires that his work for the federal account be paid with those federally raised donations. The Globe also reported last month that Baker operatives have taken fund-raising in Massachusetts to a new level, developing a unique system that uses a federally organized joint committee shared between the state party and the Republican National Committee, a system that seems to be the only one of its kind. The joint venture can, operating under federal rules, collect up to $43,400 a year in individual donations. It raised over $1.7 million in 2015 from wealthy donors, many of whom have business interests before the Baker administration. The first $10,000 of a donation goes to the state GOP’s federal committee in the donor’s name. But the rest goes to the Republican National Committee, with most of it sent back to the state GOP in lump sums — with no names attached — in effect circumventing the individual $10,000 cap. State regulators Thursday did fine the state GOP, saying it violated the law banning federally raised funds being used in state activities when it paid the salaries for two staff members to work for a Republican state representative candidate, Hannah Kane, of Shrewsbury in a special election. It ordered the GOP to pay a $2,500 fine. According to regulators, the difference between the Kane case and the Baker-Polito case is this: The two aides helping Kane did not do enough federal election work to legally justify using federally raised funds to pay their salary.